Like its iOS counterpart, OS X's notification system actually has two parts. The first is Notification Center itself, a repository of all the notifications you've received. To activate Notification Center, simply click on the notifications icon in the top right corner of the menu bar, or swipe with two fingers from the right edge of your trackpad towards the middle. This works at any time, even when you're in a full screen app. To hide Notification Center again, reverse your swipe, or click the menu-bar icon a second time. If you're more of a keyboard shortcut person, you can configure a key combination to toggle Notification Center in Keyboard -> Keyboard Shortcuts -> Mission Control. Clicking on any notification in Notification Center will launch the appropriate app and, when possible, take you to the data—the email message, calendar event, and so on—that triggered it. Unread notifications appear with a blue dot next to them, which disappears when you click on them. You can also mark all notifications for a single app read by clicking the X in the top right corner. Note that you can't clear individual messages, and that some apps—such as Calendar—have notifications that you can't dismiss. Of course, you're not always looking at Notification Center, hidden away as it is. The second part of Mountain Lion's notifications are alerts and banners, which are triggered when an application wants to pass some information along to you. While both alerts and banners take the form of small boxes that appear in the top right corner of your screen, they differ in one way: Left alone, banners will disappear a few seconds after they arrive; alerts, on the other hand, must be manually dismissed. 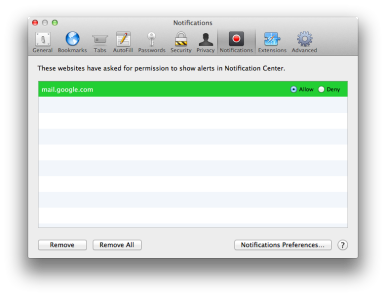 Most alerts also have a Snooze buttons, which suspends the alert for another 15 minutes, while some have other options. The Mac App Store, for example, will prompt you when updates for apps—or even OS X—are available, giving you the option to view the details of those updates or click to Update the apps right there. You can choose to have Notification Center organize your notifications in one of two ways: manually or by time. In the default manual scheme, you can open the Notifications pane in System Preferences and drag the apps and services in the left hand column into whatever order you desire. If you choose to instead organize them by time, which you can do via the pop-up menu at the bottom of the preference pane, you'll instead see notifications arrive with the most recent at the top. For each app, you can choose to see 1, 5, 10, or 20 of the most recent items, as well as decide whether the app should send banner or alert notifications (or none at all), whether an icon should be badged with unread messages, and whether a sound should play. Some of the entries in the Notifications pane have additional options. For example, if you've entered your Twitter account in the Mail, Contacts & Calendar pane, you can choose whether you want notifications for mentions, direct messages, both, or neither. And you can enable and disable the Sharing Widget, which lets you send posts from Twitter and, later this year, from Facebook, right in Notification Center. In addition, some apps take some notifications settings into their own hands. Mail, for example, features a pop-up menu in the General pane of its Preferences menu, which lets you choose to receive notifications only for new messages in your inbox, only for messages from VIPs, only messages from your Contacts, or for either all your mailboxes or a selected smart mailbox. Sadly, some apps don't offer this much needed granularity—Calendar, for example lets you turn off shared calendar messages and/or invitations in Notification Center, but doesn't let you restrict notifications only to certain calendars. Safari is a unique case for notifications, since it can actually pass along notifications from certain websites to Notification Center. How those notifications appear is dictated by Safari's configuration in the Notifications System Preferences pane, but within Safari's own Preferences, you can choose to allow or deny notifications on a per-site basis. Only a few sites support this right now, such as Gmail and Facebook, but that number will likely increase. Some apps, including Safari, have Notifications settings of their own, in the app's Preferences. If you want an app to not appear in Notification Center you could just uncheck all the boxes and set the alert style to None. But it's far easier to click on the entry in the Notification pane's left-hand column, and drag it down until it's under the Not In Notification Center section; that way, you won't see any notifications from it whatsoever. Sometimes you want to silence all your alerts for a while; if you're watching a movie on your computer, for example. With Notification Center visible, just scroll down in the pane, and you'll expose the Show Alerts and Banners slider. (You can also option-click the Notification Center icon in the menubar to accomplish the same thing.) Switch it to off, and your alerts and banners will be suppressed until you reactivate it—or until the following day, so you don't suddenly realize that you've been missing all your messages. And, to do one better, Mountain Lion will even automatically disable alerts and banners when you're presenting in Keynote, or if your display is mirrored to an external monitor. While Apple has updated its own apps to work with Notifications, third-party developers will have to update their own apps to work with the system—and Apple has limited access to only those apps in the Mac App Store. Fortunately, the developers of Growl—which itself has now transmuted into a Mac App Store app—have already pledged compatibility with Notification Center, so there should be some support for those non-App Store apps left by the wayside.